Bemithil significantly increases overall endurance and body weight. Its action is the stronger the higher the exercise. 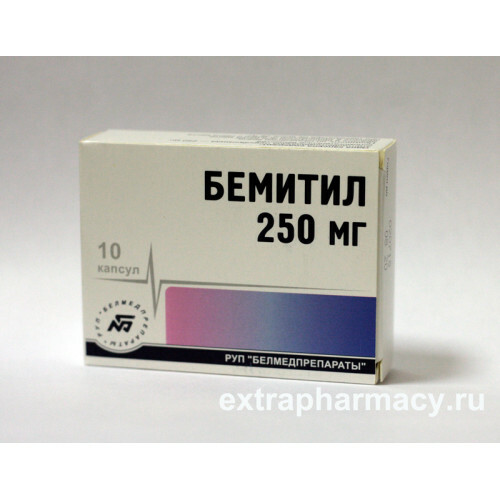 The increase in performance under the action of Bemitil can reach 200%, especially in conditions of lack of oxygen. The drug increases resistance to high temperatures. asthenic disorders of different nature (in neurasthenia, somatic diseases, after serious infections and intoxications, in pre-and postoperative period after surgery). in the complex therapy: ported head injury; meningitis; encephalitis; cerebrovascular accidents; cognitive disorders. Discomfort in the stomach and liver; rarely - nausea, vomiting, allergic reaction (facial flushing, rhinitis), headache. In these cases it is necessary to reduce the dose or stop taking. Symptoms: irritability, night sleep disorders. Treatment: gastric lavage, the appointment of activated charcoal, symptomatic therapy. It is necessary to reduce the dose or stop taking the drug. 250 mg (1 capsule. 250 mg or 2 caps. 125 mg) 2 times a day. If necessary, the daily dose is increased to 750 mg (500 mg - in the morning and 250 mg - after lunch) patients with body weight more than 80 kg - 1000 mg (500 mg two times a day). The course of treatment - 5 days. Depending on the effect of therapy, spend an average of 2-3 courses (rarely - 1 or 4-6), in order to avoid accumulation of the drug, between courses is recommended to do a two-day break. To improve performance in extreme conditions take medication for 40-60 min before the forthcoming activity at a dose of 500-750 mg. If you continue readmission produce after 6-8 hours at a dose of 250 mg. The maximum daily dose - 1500 mg, and the next day - 1,000 mg. !! please note, that product may be labeled in Russian and provided with instructions in Russian. if you need instructions in English - please add a comment in the order form.